Nice to have a day off teaching and a chance to try out some ideas I have wanted to try for some time. I had always liked the idea of providing my students with the answers to exercises from the course book that we have done in class: this way anyone missing the class at least has the solutions, so if they are serious about learning they can see if they can get the exercises right. At the same time I am very keen on getting students to do exercises again (and again), but sadly most course books lay the exercises out in such a way that if students write in the answers the exercise is destroyed and simply can't be used again. 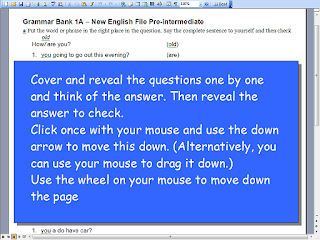 As a result I have asked my students NOT to write the answers in the book, and in fact, preferably, not to write the answers at all: it's really easy with the IWB to get students saying the answers in pairs. 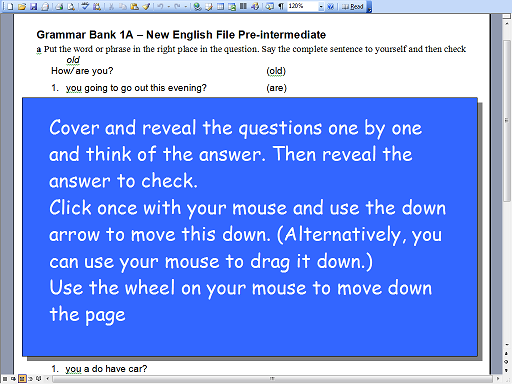 So, what I decided to do was to type out the answers to the exercises to send to my students. (A colleague of mine has prepared photocopies cut and pasted from the teacher's book.) I then decided to type up the questions as well as the answers and make sure it is possible to cover the answers, say the answers to oneself, and pull done the cover to check it's right. I've made many exercises like this before and even got students to do them in class, but this time the idea was to produce something for them to use out of class. I also found time to send my students a list of links to the New English File Pre-intermediate Online site for the section of the book we did yesterday 1A. I made a simple word document with the three links and some instructions about telling me about how well they did it all and sent it as an assignment to be done in the next seven days. Having a Word document will make it easier to sent again next year. And then I realised I hadn't re-installed Dreamweaver 2004MX since I upgraded to Windows 7. It was easy-peasy and I was pleased to find the printout with my licence number immediately. That meant I could add the video and the lyrics to Edmodo for my Intermediate students. It's here http://www.edmodo.com/public/intermediate-2010-2011/group_id/58301 It may be a long way down. I must admit that I really enjoyed myself, even though, it meant I was working all of my day-off.